Ron and Tina Witters founded the North Dayton program after driving to Centerville for a year because there was nothing available north of Dayton. Bob Glavin from the South Dayton TOP Soccer program encouraged them and gave them support to start the North division in 2002. They continue to fund this program to this day and through a grant received from the "Dayton Foundation" until 2011. 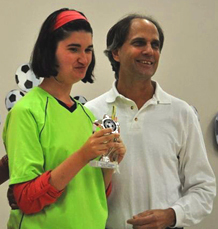 TOP soccer is an outreach program from US Youth Soccer. The link below will provide you with history information. There are two (2) programs in the Dayton area. This website focuses on the North Dayton Program, which plays at the Vandalia Rec Center. North Dayton had 50 players last season. Our season runs late August until late October. We play on Wednesday evenings and Sunday afternoons. There is also a South Dayton program which plays in the Centerville area. Last year they had 150 players on the team. For more information about that program, please contact Nancy Ferrara at 937-985-7735. Players from all locations are invited to play in either program. The Cincinnati TOP program has 3 separate programs and holds an area tournament every fall.